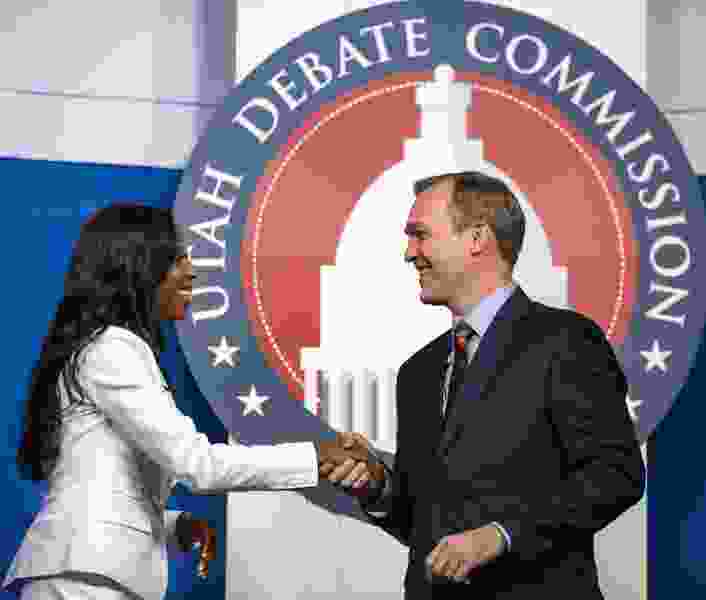 Rep. Mia Love and Salt Lake County Mayor Ben McAdams shake hands as they take part in a debate at the Gail Miller Conference Center at Salt Lake Community College in Sandy on Monday, Oct. 15, 2018. The two are vying for Utah's 4th Congressional District seat. As GOP Rep. Mia Love and her Democratic challenger, Salt Lake County Mayor Ben McAdams, slam each other as untrustworthy in a barrage of negative ads, their stands on key issues seem to have become drowned out in all the noise. But they have real differences on a range of policy issues from immigration to support of President Donald Trump, from Medicare and Social Security to health care, and from abortion to public lands. Here is a look at the candidates’ positions on issues in the only congressional race in Utah that polls show is close enough to be competitive. While both candidates call for better protection of the border, McAdams opposes Trump’s wall. Love has voted for bills that would help build or fund that wall. McAdams supports a pathway to citizenship for “Dreamers,” people brought as children into the country without documents by their parents. For other undocumented immigrants, he supports a pathway to legal residency — but perhaps not full citizenship. “A pathway for permanent residency is probably reflecting the pragmatic realities” of millions of undocumented immigrants living in the country, McAdams said. But to help promote legal immigration, “we don’t want too easy of a process on the other side” for the undocumented to win citizenship. Love has said she favors and has voted for legislation that would provide a path to citizenship for most undocumented immigrants — not just “Dreamers” — as long as they do not have criminal records and are working or going to school. “I hate this idea that there are two sets of Americans … those who are Americans in their minds and hearts, but one set who can seek citizenship and others who cannot, no matter what,” including “Dreamers,” she told The Salt Lake Tribune’s editorial board. Both oppose separation of families at the border. But McAdams charges that Love has not done enough to stop it and sometimes takes undue credit on the issue. Love — a daughter of Haitian immigrants — scoffs at that, saying she helped push a bill to stop separating families and bucked House GOP leadership by signing a discharge petition that helped force votes on immigration bills. The bills in question failed to pass. Love had responded at the time by encouraging The Tribune to call Rep. Marcia Fudge, D-Ohio, a former chairwoman of the Congressional Black Caucus, who she said would back up that Love is not taking any false credit and is a leader on immigration issues. Fudge did that. Whether and how much each candidate supports Trump and Democratic House leader Nancy Pelosi of California has become an issue as their tight race is one of a relatively small number across the country that could decide control of the House. Both say they will work with him on important items and oppose him when necessary. “I don’t answer to the president. I’m not scared of the president. I work with him when appropriate” — such as pushing for the release of Utahn Joshua Holt from a Venezuela prison, she said. He says that Love “votes with Trump 97.5 percent of the time. … Nobody’s on Utah’s side 98 percent of the time.” The nonpartisan poll and statistical analysis site FiveThirtyEight puts her Trump-supporting vote rate at 95.7 percent. McAdams has attacked Love for discussing raising the retirement age or altering Social Security and Medicare benefits. Love says that is deceptive, adding that she has only pointed out that reforms of the programs are needed to prevent them from going bankrupt. To save the programs, she said, eventual benefits for people who are now younger than age 50 “are going to look a little different” — but she stresses she does not want to cut benefits for those who have already retired or are about to do so. Both candidates say they favor in the future perhaps reducing benefits for wealthy people to help the programs survive. Love has repeatedly voted to repeal the Affordable Care Act, or “Obamacare.” McAdams says he wants to work with both parties to fix it, instead of scrapping it. “For the Democrats to push through the Affordable Care Act without a single vote, and the Republicans to push repeal and ‘Trumpcare’ without a single Democratic vote is endemic of a broken Washington,” McAdams said. 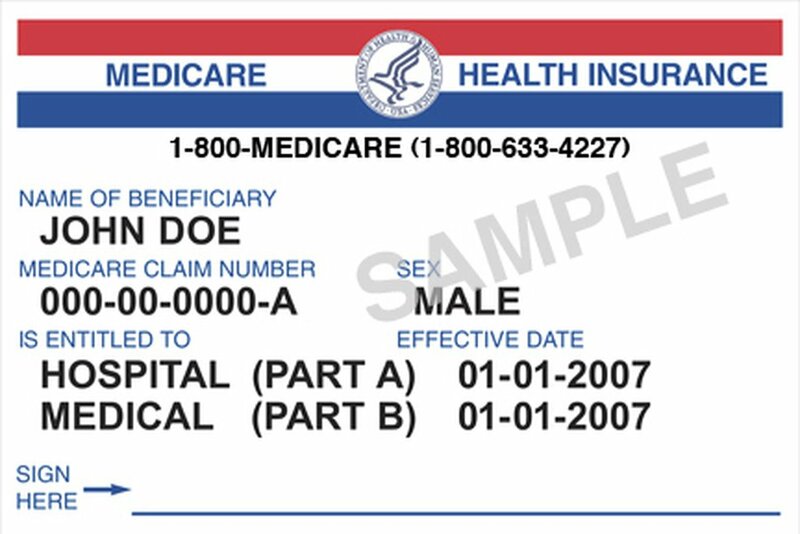 He vows to push to ensure parents are able to keep adult children on their insurance polices until age 26, and to oppose allowing insurance companies to refuse to accept people because of pre-existing conditions. He vows to ensure people do not lose government coverage for working hard and obtaining a raise. Love said she has voted for legislation that “wasn’t completely doing away with but fixing some of the major issues we had with the Affordable Care Act.” She says, “We have got to lower the cost of health care” and will explore ways to do that. In a perpetually a hot-button issue for Utah, Love has attacked McAdams as a champion of unrestricted abortion rights. He cried foul, saying his position on abortion is the same as hers. Both are members of The Church of Jesus Christ of Latter-day Saints and actually take somewhat tougher stands than it does. Their church also does not oppose abortion when the health of the mother is threatened. It also does not oppose the procedure when a fetus has severe defects that will prohibit survival beyond birth. 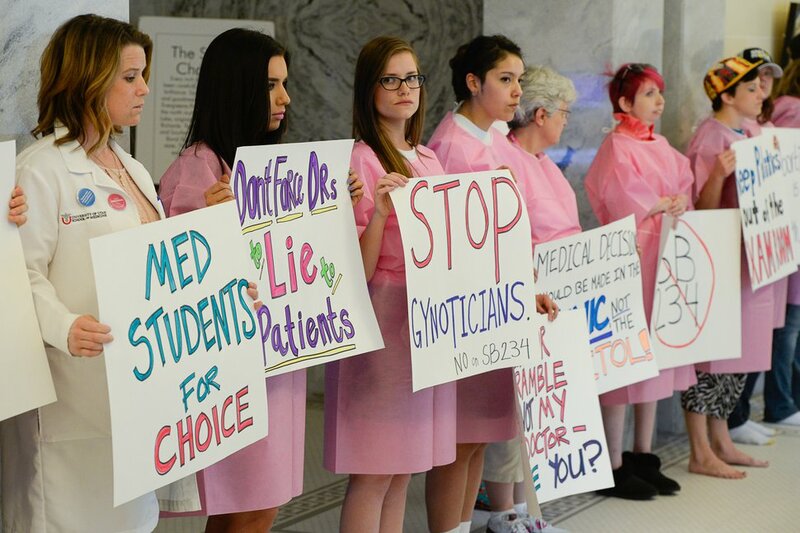 Francisco Kjolseth | The Salt Lake Tribune Planned Parenthood advocates hold a silent protest at the Utah Capitol in opposition to SB235, which requires anesthesia for a fetus before an abortion any time after 20 weeks of gestation. Proponents argue that the legislation is not based on science, nor is it in line with standard medical ethics. As a state senator, McAdams did vote against some anti-abortion bills, including one to impose a 72-hour waiting period. He said most of those votes hinged on the fact the bills were poorly drafted. Love said she sponsored a bill to allow obtaining contraception without prescriptions. She also supports legal efforts such as a Utah law imposing a waiting period before an abortion may be obtained. The anti-abortion Susan B. Anthony List was a conduit to help Love raise nearly $13,000. McAdams denounces as overly partisan Trump’s action to erase much of the Bears Ears and Grand Staircase-Escalante national monuments. He has a similar criticism for the original designation of those protected areas. While he said Clinton’s actions “were irresponsible, President Trump did the same thing. There was no stakeholder building except with a handful” of allies. Still, she says, “I don’t like the decision-making being done by one person” and she would like to see more collaboration on national monument decisions.